As a kid, we would sometimes have biscuits. Made with Bisquick, and often fresh chives from the plant in the backyard (and, by the way, if you want a low light herb garden? Look into chives. They even flower!). 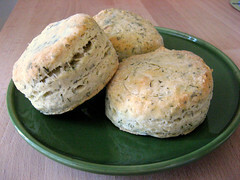 They were “drop biscuits”, and they were yummy, but there were no layers. When my mother relented and bought biscuits-in-a-can, it was amaaaazing. You could pull them apart! And as I grew older, they were even more fantastic, because one could buy biscuits and crescent rolls that tasted buttery, but had no actual butter in them! Perfect for the lactarded. Unfortunately, they also have lots of ingredients I can’t pronounce. Which I’m not opposed to ALL the time, but it would be nice to be able to make them from scratch sometimes. I’ve played around with them a bit, but while they’ve been yummy, they’ve never had layers. I expected that in order to get them perfect, I was going to HAVE to use butter, and learn some crazy puff pastry type procedure. Nope. I mixed some things together, patted the dough out, folded, refolded, patted, folded, folded, patted, and then cut them out. And they had FLAKES. It felt like a minor miracle. Mix flour, baking powder, salt, and any herbs in a bowl. Spoon the vegetable shortening into the flour mix as you use two butter knives in a scissor motion to break it up and mix it. (I just cut the stick of chilled margarine into little pieces with a knife. You’re going for “pea sized pieces” in this sort of thing, just like pie crust. You can also use a stand mixer or food processor.) Once you’ve got nice, relatively consistent crumbs of shortening and flour mix, pour in your soy milk. Mix this up until you’ve got a dough. Then put it on your counter and start rolling it out. Roll it out to about an inch or so thick, then fold it in half on itself, and do it again. (I did this process twice. Not sure if it’s necessary.) Then grab a biscuit/cookie cutter, or glass and start cutting biscuits. For your extra dough, I roll it back into a ball, and start over. Roll it out to an inch or so, fold it over, and roll it out again.